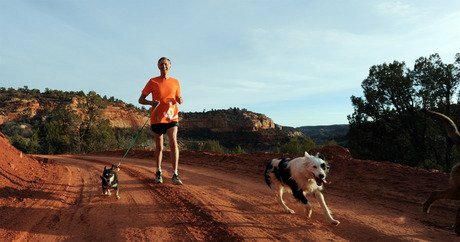 With his dog, Shadow by his side, Gregory Castle, CEO of Best Friends Animal Society, is getting ready for the race of his life. Castle, an avid runner who has completed 17 marathons since 1999 (including three Boston Marathons), will run in the grueling Grand to Grand Ultra Marathon on September 21. It is the only self supported stage foot race in the country. The number 17 plays an important role in this race. In addition to completing 17 marathons and expecting to run 170 miles in this race, Castle has set a personal fundraising goal of $170,000 to benefit Best Friends, of which more than $77,000 has been met as of late August. “I’m very pleased with the amount of attention this has been getting. Over 1,000 people have donated so far,” Castle says. Going the distance is nothing new for Castle. It took him two years to qualify for his first Boston Marathon, which he ran in 2004, 2006, and 2009. Castle’s marathon personal record is 3:58. Utah is currently at an 80.3 percent Save Rate: 91.3 percent for dogs and 63.3 percent for cats; 90 percent is the recognized benchmark for No-Kill status. In addition to funds, raising awareness for the 9,000 dogs and cats killed every day in U.S. shelters is crucial to Castle. Best Friends’ Save Them All call to action has 30 ways for pet lovers to help homeless dogs and cats in their community, including adoption, spaying and neutering of current pets, volunteering, and networking pets in need via social media. Castle is one of the founders of Best Friends Animal Society, which celebrates its 30th anniversary this year. Since its founding, Best Friends has helped reduce the number of animals killed in shelters nationwide from 17 million per year to about 4 million. Best Friends has the knowledge, technical expertise, and on-the-ground network to end the killing and Save Them All.